The golden arches appeared for the first time in New Zealand at Cobham Court, Porirua. Big Macs were priced at 75 cents (equivalent to about $6 today), cheeseburgers 40 cents and hamburgers 30 cents. More than 100 eager customers were queuing outside when the doors opened at 10 a.m. Twenty years later the American fast-food giant opened its 100th outlet in the country. Rivals Kentucky Fried Chicken (now KFC) had arrived in New Zealand in August 1971. Both organisations faced challenges here. A licensing system restricted the importing of products that could be made in New Zealand. The McDonald’s kitchen was supposed to be sent back to the USA once local companies were able to reproduce it. The resulting trade negotiations were a windfall for the New Zealand Dairy Board (the predecessor of Fonterra), which was able to offload some of its cheese surplus in exchange for more imported kitchens for McDonald’s. 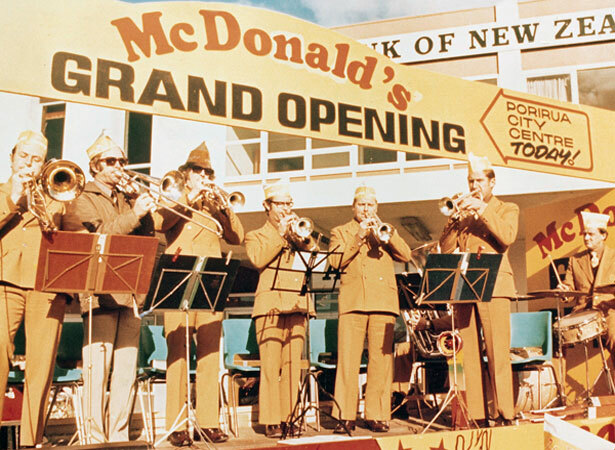 New Zealand’s second McDonald’s restaurant opened in Queen St in Auckland in July 1977. The first drive-throughs opened the following year, in New Lynn (Auckland) and Lower Hutt. We have 2 biographies, 1 article, related to McDonald's arrives in New Zealand.